ATTENTION: This is a FREE software and the price is meant to donation only. If you want to support future updates and development of this app click in buy button to donate. If you don’t want you can use the free version. THERE ARE NOT ANY DIFFERENCE BETWEEN THE FREE AND PAID VERSIONS. 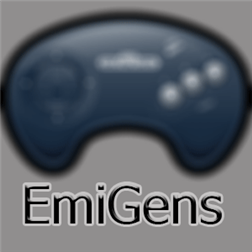 EmiGens is a Genesis/Sms/GG/Sega CD emulator for Symbian and Windows Phone! Play your favorite titles , save your progress at any time and return instantly to where you left off. EmiGens needs Genesis/SmS/GG/SegaCD game ROMS(.bin, .smd, .sms, .gg, .iso, .zip) to work. It does not contain any roms and it does not condone piracy. You can get the roms through backup of your original cartridges or cds. On Windows Phones you can Load Roms from SD card in formats .bin, .smd, .sms, .gg (iso and zip are hidden by the OS), from SkyDrive in all formats(.bin, .smd, .sms, .gg, .iso, .zip) and from direct download from internet like e-mail attachment. Sega CD support requires a original Sega CD BIOS which is Copyrighted from Sega and can’t be distributed, It can be a backup from your Sega CD board. This product is not affiliated with, nor authorized, endorsed or licensed in any way by Sega Corporation, its affiliates or subsidiaries. Sega Genesis game software sold separately. Sega and Sega Genesis© are trademarks or registered trademarks of Sega Corporation. All rights reserved. Company and product names are trademarks or registered trademarks of their respective companies. All brands/names/images/etc are copyrighted by their respective owners.